On Wednesday we drove up to the build to see what has been going on. We hadn’t been for 10 days, as there was a hold up with the windows. Boy, things really look good. The windows are now in and looking very good. 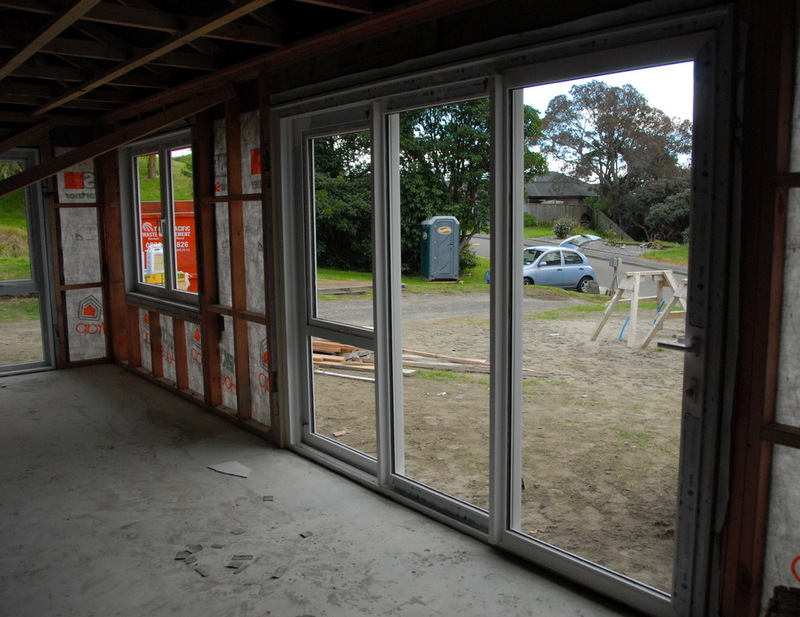 We are very happy with the way the windows look and are pleased we went with the white frames. They still look a little grey as most of them still have a protective plastic skin on them. We did think the front door had been set a little low. There was quite a gap at the top and the door just cleared the concrete floor. By time we have tiles that could be a problem. That will now be rectified. Also we don’t like the frosted panels in the front door. Here it looks like just a few panels are frosted, but actually the other ones don’t have any glass in yet. This is the only window which actually has any glass in it. Evidently the French doors are also at a slight angle. Strangely enough we didn’t notice that!! That will also be fixed of course. The others don’t have any glass at all, though it really is an optical illusion, as until you have put your hand through the space, it looks like there is glass in them. We are having a meeting next week about what we would like instead of the frosted panes. I don’t mind if it is just clear glass like the rest of the house. But we will see what else there is on offer. One other thing we noticed is the fact that the meter box in the garage has finally been put in the right position. We are very happy to see that. I love the really large bay windows. It will really be wonderful to sit here when the window seat is installed. Elizabeth and I had problems trying to work out how to open the second half of the French doors in the formal lounge. For some reason we don’t have a photograph of this door. There is a handle on the right side and that opens easily. There didn’t seem any way to open the other side. Martin came along and saw once the right door was open, in the actual door itself is a pop out handle to open the other side. Very ingenious. The other place where there is an ingenious handle is in the large stacker doors in the family room. On the left side there is a window that can be opened if it is too windy to open the whole door. The handle of course can’t be normal as then it couldn’t be a stacker door. The handle is actually flush with the window frame and pops out to then open the window. Simon had told us that the bricklayer would be there, but evidently we just missed him. 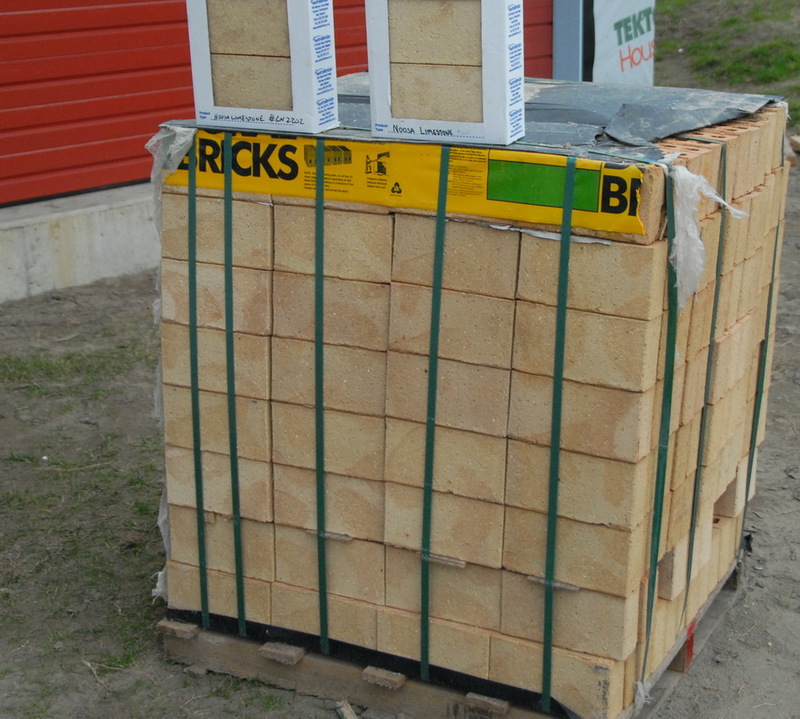 But at least all the bricks were on site and we were able to check they were what we wanted. They are a pretty good match to our original choice which was from a different company. The boxes on the top are the original bricks. It will be lovely to see these installed. We went up to our section yesterday, not expecting to see much progress. We were pleasantly surprised. The roof is now totally finished and the scaffolding gone, the eaves are finished; the garage door is in place, but of course no electricity yet, so we had to pull it down by hand. Elizabeth was amazed at how easy that was. A lot of the bracing inside has gone, so now you can actually visualize the interior space as it will look. The builders have also swept inside which strangely seems to make a big difference. Bay windows in front of Martin, then the front door, stacking sliders and windows in dining/family room space. 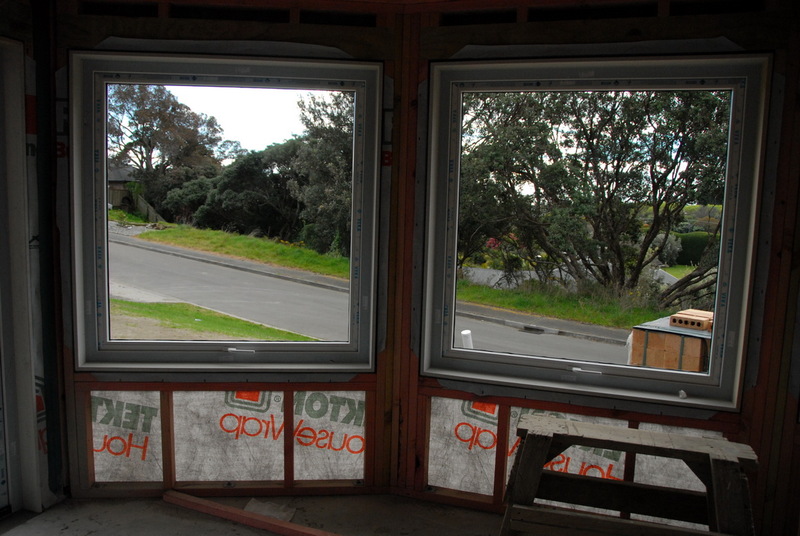 This is a view from where my kitchen sink will be to the front door and bay windows in the formal lounge. Looking from the kitchen to dining area and family room. 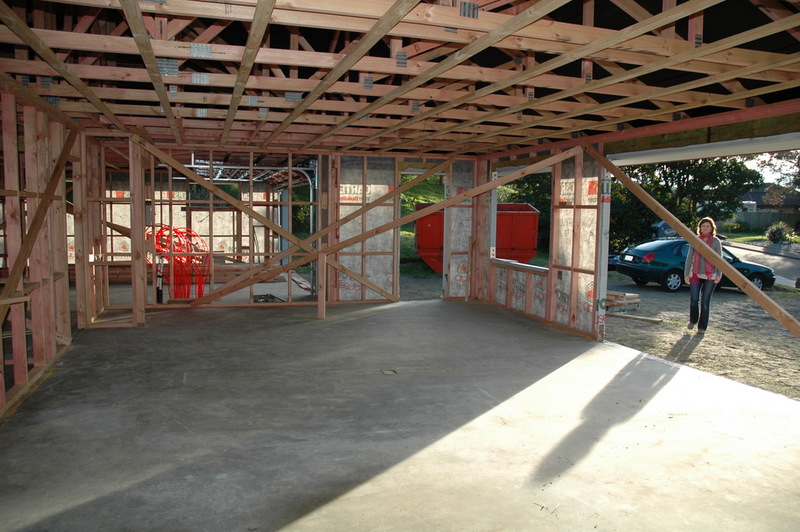 The red pipes at the end of the room are actually in the garage and will be the controls for the under floor heating. Victoria, Paul and the children came with us to the section. Paul hadn’t seen any of the building. Last time he was there, we were just working out where the house was going to be. Grace and James also came along to have a look. James is very interested in how much the actual way of building a house has changed since he was part of that whole scene. No metal bracing goes in now. But that means the gib board (dry wall) has to be much stronger. James climbed up to see the area we have for storage above the garage. He was surprised his damaged shoulder stood up to that task! 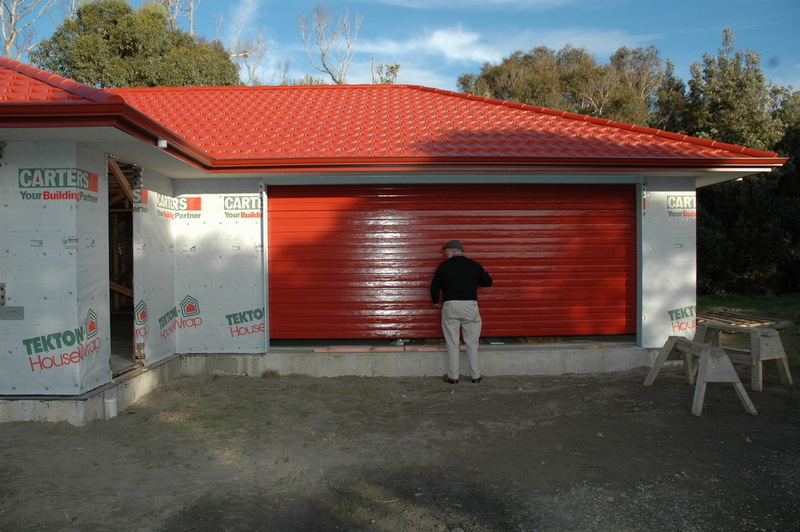 I am quite surprised that the companies who make the roof tiles, guttering and garage doors don’t actual confer with each other. Those three components are actually slightly different colours, but a pretty good match luckily. It would be much easier if the companies used the same colours! Next week the windows are supposed to arrive and be installed. This will take a week then two weeks to do all the brick laying. So in about three to four weeks the house will finally be closed in. Once that has happened the retaining wall, drive, patios, and paths can be done. Martin and I had another meeting with the guy doing the kitchen last week. We are now thinking of upgrading the granite in the kitchen. We much prefer a darker colour, but the darker colours are much more expensive. Once we know the difference in price we can make a decision. Once again while up there the weather was wonderful. 16oC (62oF?) on a mid-winter afternoon is not bad. The sun was shining and the birds were very busy in the surrounding trees. One huge wood pigeon almost clipped Elizabeth on its way passed her. She got a real fright. There were a few rosellas in the trees as well. These are Australian birds and very pretty. 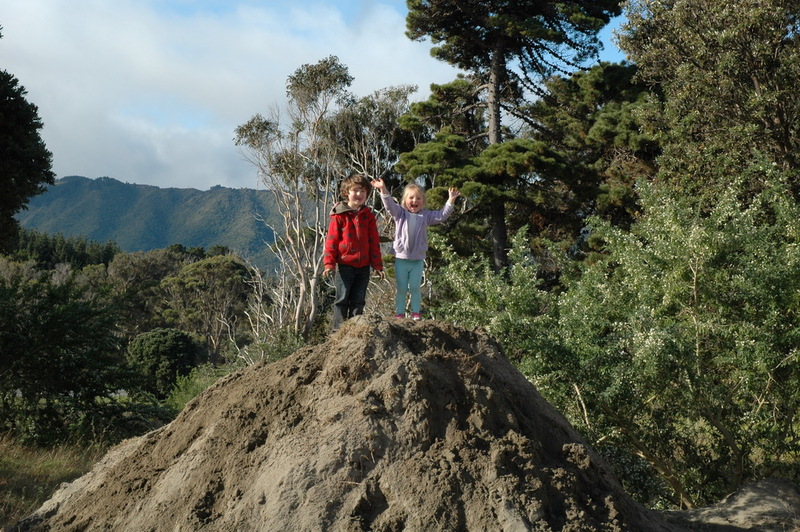 Harper and Millie once again had lots of fun playing on the huge pile of sand from digging the hole for the 10,000 litre water tank. They were also looking for tigers and crocodiles!!! Harper said he saw a tiger’s ear!!! When they are a little older they will have lots of fun going down the bank at the back and exploring. Harper is still upset about the tree that had to be cut down. We were going to build the kids a tree house in that tree. 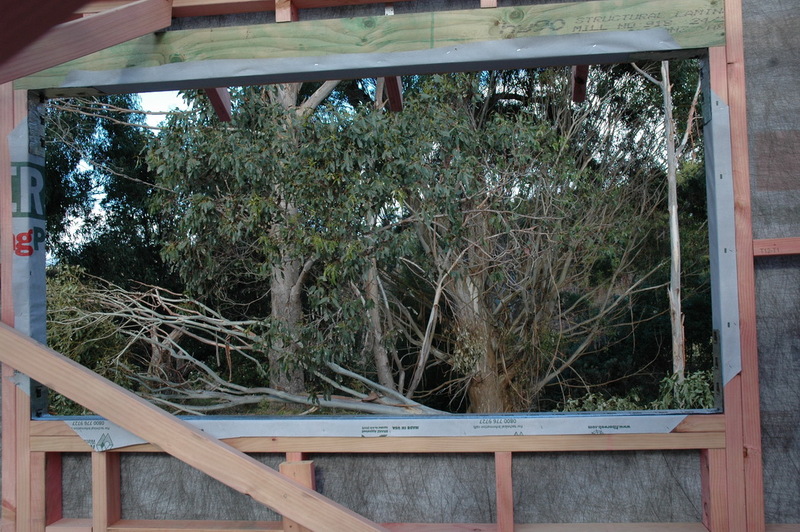 The other trees are not on our property and access to them would be very precarious. So now we really will have to find the money to build Cate’s Folly! This is to be a spiral staircase with a circular platform at the top. With a roof and a seat all the way around inside. From here we would have a view of the sea/ocean. Harper said that would be just as good as a tree house. It will be wonderful to sit up there in the evening having our nibbles and drinks!! Once again not much to report on the build. The builders are on holiday for a couple of weeks. 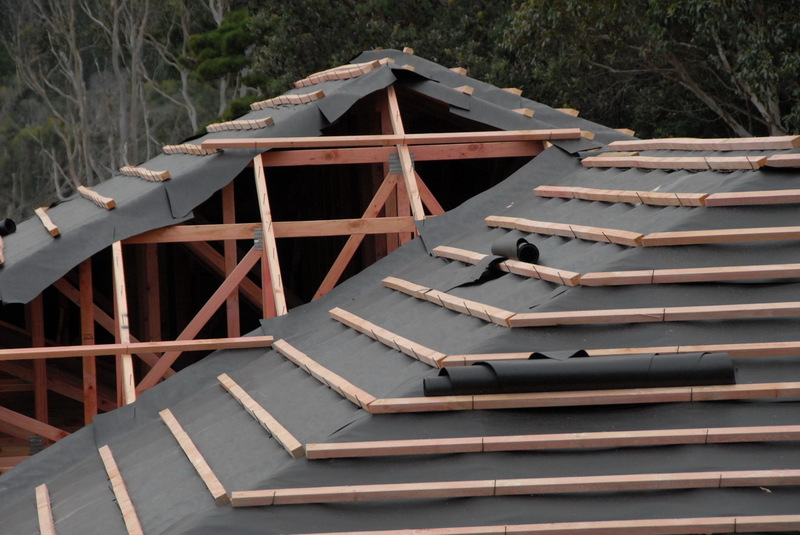 The single roof guy is working very slowly on the roof, even though when we saw him working he seemed pretty fast. After two weeks he has still not finished, but almost there. We do have some very good news though. We have sold our home in Maungaraki and it has not even been put on the market yet! Martin was talking at a local Hutt City Council meeting a couple of weeks ago. 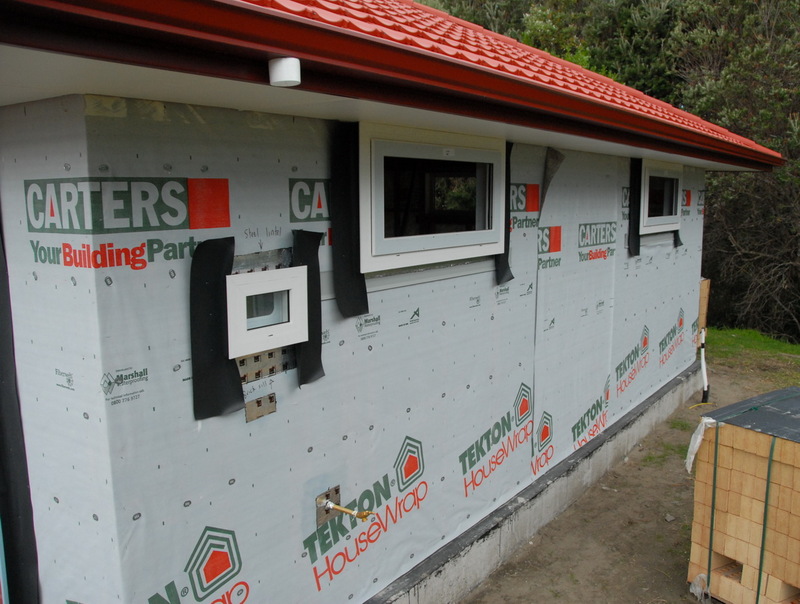 After the meeting he was talking to one of the councillors and telling her we were building in Waikanae. She asked him if we were selling a house and where was it as her daughter wants to buy in Maungaraki and it must be below $500,000, have a really good view, four bedrooms, and two bathrooms. Martin said yes to all of those. Anyway last Sunday the young couple came to have a look. An hour later they rang to ask if they could bring their parents to look as well. As they all left, the father said if the couple didn’t buy the house he would. On Thursday they came around to talk turkey. We were very happy with the result of that meeting. The couple don’t have to wait to sell their flat, as the father wants to buy that, as he owns the back flat anyway. The other thing, they said we could stay here until our house is finished. This fact was what clinched the deal. Moving just once will save a lot of money and fuss and bother. This also mean we can start packing books etc and not worrying about having our house ready for viewing. 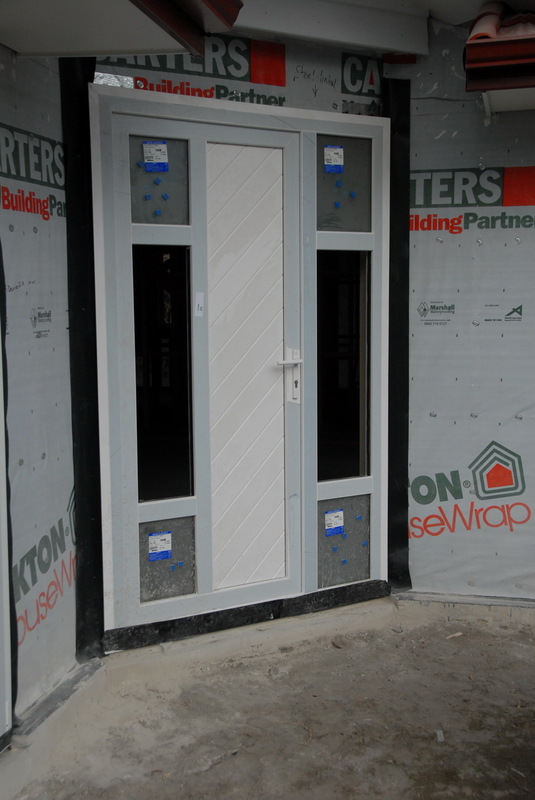 We are now trying to get a firm finish date from our builder. He should be able to tell us once all the outside work is finished. Though that may not be for about 6 weeks. There is still a hold up on the windows and nothing much can be done until they are in. We have now been given a finish date of 23rd November, with a settlement date on this house of 30th November. It has been several weeks since I last wrote my blog, partly because any progress made was not something that would show on a photograph. Now there has been lots of progress that is definitely visible. In fact even rather exciting. But I am going back a bit as well. 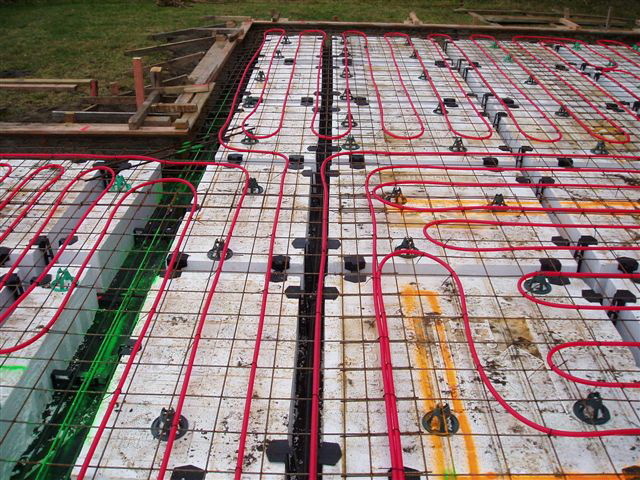 We missed photographing the under floor heating pipes being laid on the polystyrene foundations. Luckily the guys doing this had taken several photos and sent some to us. Since then of course lots has happened. The build is really beginning to look like a proper house now. This guy was working yesterday on Sunday afternoon. We have had a few trials and tribulations to get this far. At one point we had noticed one of the pieces of wooden frame had a crack running right through it. This has now been braced on either side. Hope that is enough. Though we can understand, it would have been a huge job to actually replace it. Another problem was the electrical meter box was put in the wrong place. This is quite important, as that was our one large uninterrupted wall in the garage that we are going to use for storage. We have been told that will be shifted, but has not been yet! Evidently there was a mistake made when pouring the concrete and on some places it has to be cut to make way for the runners for the stacking sliding doors. Hopefully we have picked up any problems whilst they can still be fixed! A week ago we went out to meet the plumber on site. This was to fine tune where all the plumbing fixtures are going. Last week we met the electrician on. This was much harder as we had to say where all the light fittings, power points and light switches are to go. Martin and I had slaved over this for quite a few hours. It really is hard to do this on paper and then visualize that on the actual build. 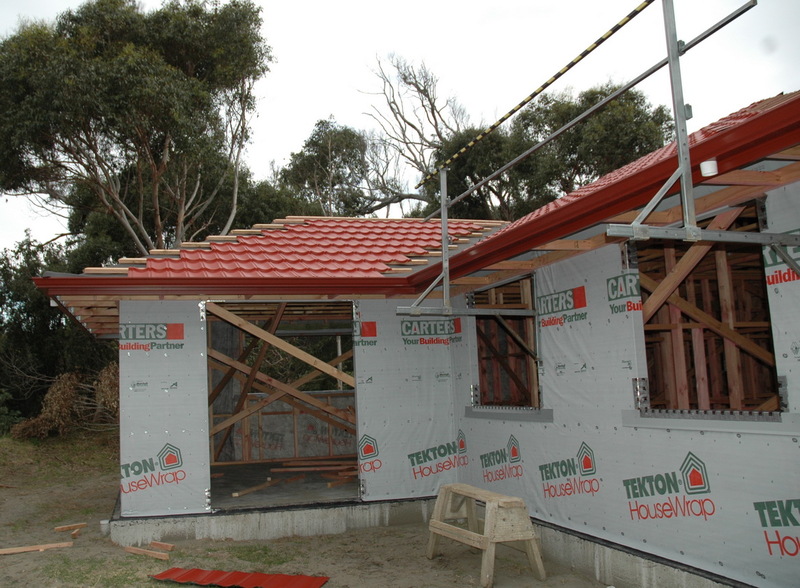 This would be much easier when all the interior walls are in place, but of course has to be done before then. The hardest of all was to find positions for light switches, especially as we have such an open plan house, with very few walls to actually put them on. We think this may even need some more fine tuning. This stage also included where all phones, internet cables, TV and sky connections will be. We are not sure that the electrician actually knew much about TV and phone connections. I think we are also future proofing for fibre optics. I don’t even know what that is!! I still have this weird feeling that this house is not actually ours!!! Not sure how to get over this. It really is weird, as if we were doing this just to make a quick profit, we would not be putting our hearts and souls into the build. Though Martin keeps saying that if we are offered anything over 1.2 million dollars, he would do it again!!! I am not so sure about that. Not sure if our marriage could stand the stress of another build! Maybe once there are fitting inside and we can see all the things we have chosen, it will feel more like ours? Not sure when we can get up to the build again. Life is getting very busy. We do have to go and see the kitchen guys later this week. We really want to sort that out, as so far it is just our plan of the kitchen and that is not nearly precise enough. It is Harper’s 6th birthday today. He had to go to the dentist this morning. That really is a bummer on your birthday. On Sunday afternoon we have a couple coming to look at our house here. It would be wonderful if we could sell before we had actually put the house on the market! That is all till next time. Martin and I arrived home from Melbourne on Friday evening. We could hardly wait to head up to the section late Saturday morning. It really was exciting to see all the progress that had been made over the past two weeks. 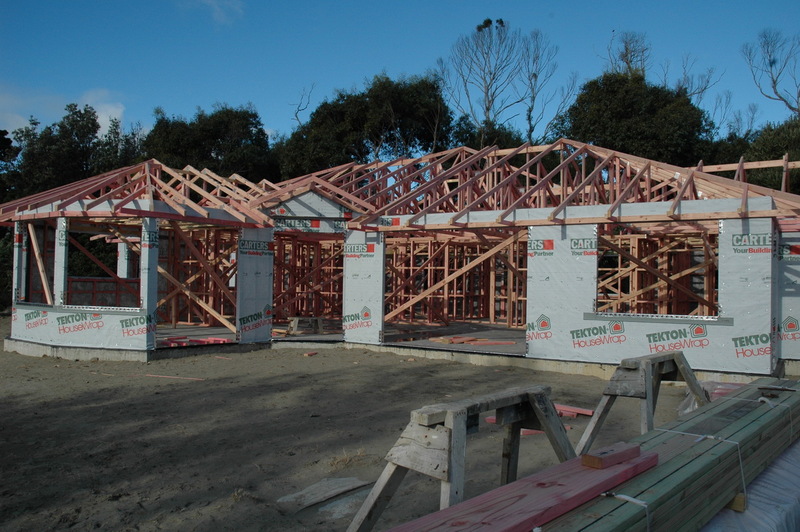 Most of the framing and roof trusses are now in place. The house has also been wrapped in whatever the stuff is called. I think it is for water proofing the house. Most everything is where it should be, though we are a bit concerned that the underground water tank is closer to the house than we had hoped. We were hoping to hide the above ground part, which would have been hidden in the garden that will be near the front fence. We will now have to make a feature of it. That will need quite a bit of thought. The black part just to the left of Millie is the part we are worried about hiding somehow. Victoria and the children joined us on site. 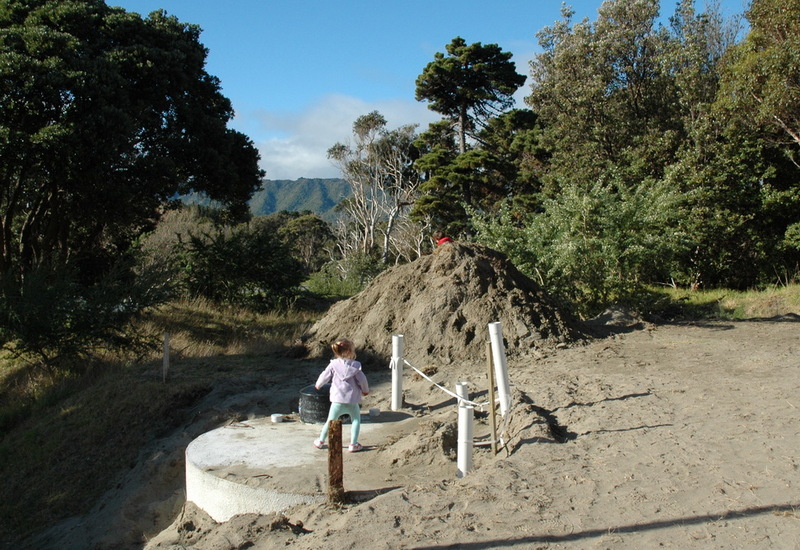 The kids were pretty excited especially as they saw the huge pile of sand left from digging the hole for the underground water tank. They were climbing up and sliding down this for over an hour. They were also searching for tigers on the section next door!!! 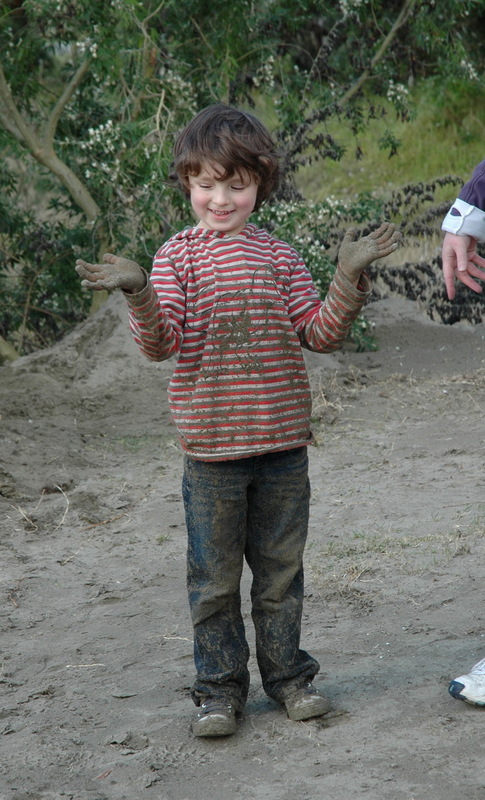 We had to strip them both down to shake off all the sand before we could let them get back in the car. Both Martin and I took lots of photos. I was particularly interested in taking photos of the views we will have from each window. This is the view from one of our bedroom windows. On the left you can see the tree that had to be cut down. We were very sad to see this. 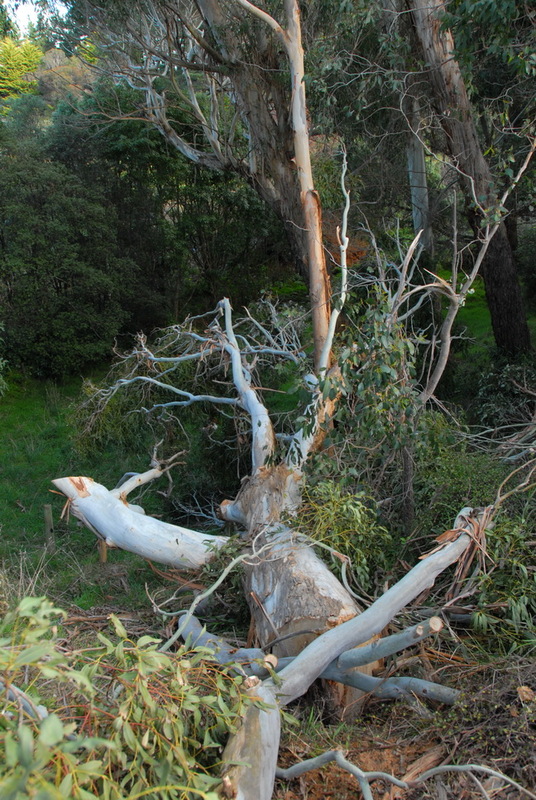 It was a beautiful very large gum tree. I have been thinking that maybe we can take a slice of the tree and make it into a coffee table. We could also use a bit from higher up the trunk to use as a leg for the table. We could also use some slabs as stepping stones. At least by doing something like this we are retaining something of the beautiful tree. The house overall still looks really large, but some of the actual rooms still look rather small. Very strange. The eye can really be deceiving. We may go out to look again tomorrow. We want to go up there when the builders are on site. We want to see if we can have more idea as to what happens next. We also think we may now be able to set in motion building the retaining wall. Elizabeth / Beth here, as Mum and Dad are still away in Australia. 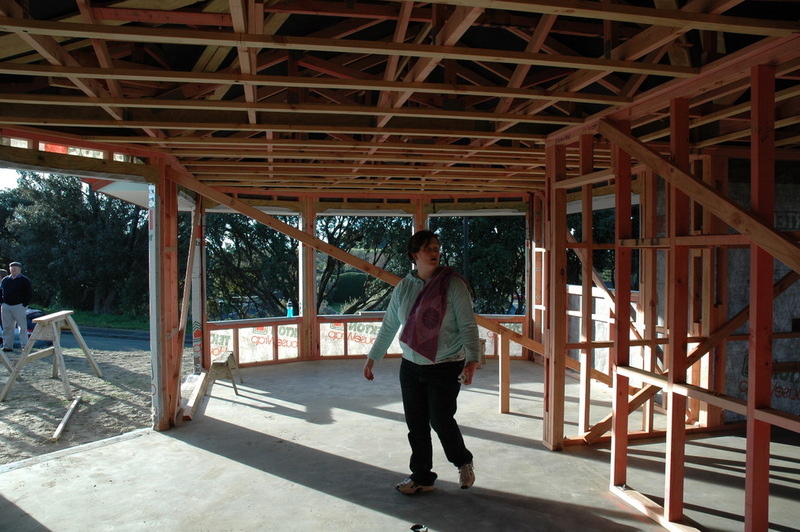 Last Thursday I took a quick trip up to see the progress on the house, in time to see the builders finishing up the framing. 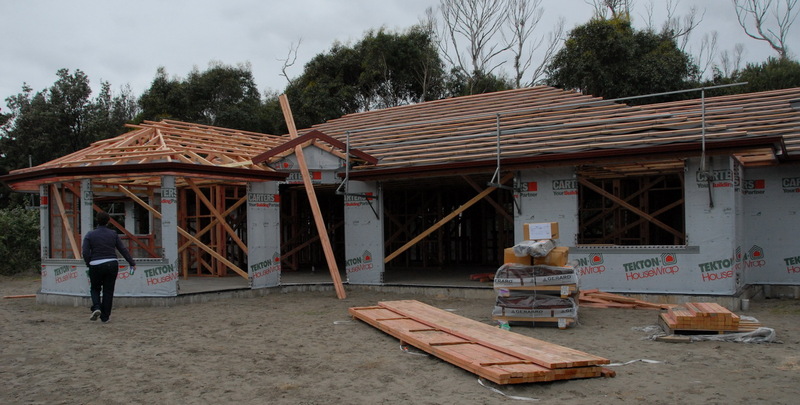 It was impressive to see the house actually taking shape, and looking like a house. I didn’t want to get in the way of the builders, and so I just wandered around the outside of the house, taking photos, and checking a few things I know Dad and Mum would want me to check. It was fun to look into the various rooms and spaces within the house, and visualise the home we’ll be moving in to later this year. And standing in front of the windows (well the spaces the windows are going to be) and seeing the views we’ll be seeing once we’re inside our new home. It was late in the afternoon when I was there, and the whole place was bathed in a lovely autumn sunshine, making it look warm even though it was rather cool. 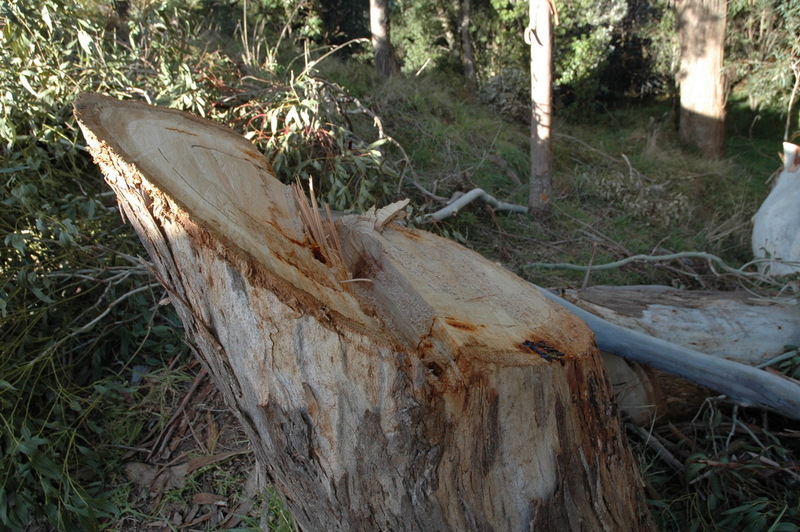 The one sad note was seeing the lovely big gum tree had been cut down. We knew it had to be cut down, as it was dying, and if left, it could fall on the house, but still it was sad to see the tree is gone. It was a lovely looking gum. There are a few other gums and the back of the section, but this one was the only one that was definitely ours (on our property). I hope to go up to see the house again later this week, and see what else has happened. Mum and Dad return on Friday night, and so we will go up so they can see the house over the weekend so they can see the progress themselves. Also, Victoria and Paul and the children will hopefully come too. Elizabeth here – just a quick post.